Folks from across the West District gathered together for the 2019 Day of Learning in Glendale, Yuma, and Cottonwood February 2. We opened our time together considering God’s call for us to be fruitful disciples (John 15:5-8, CEB.) We drew inspiration from three examples of the fruitfulness of our ministry as a conference. We saw the fruit of loving like Jesus in a video called Tonga Thank You (https://www.youtube.com/watch?v=FPlWbZn_ShI&feature=youtu.be). We heard the testimony of one of our University of Arizona Frontera students as she spoke of acting for justice through the Inn Project ministry to refugees (https://youtu.be/8btFjAk9a20). And finally, we saw how through our apportioned giving we nurture disciples in our Camp and Retreat Ministries (https://vimeo.com/274584987). Through the wonders of technology, attendees from all three locations elected Rev. Court Fischer the Chairperson of the District Church Location and Building Commitee and Rev. Patti Blackwood to serve on the District Committee on Ordained Ministry. I shared that I will be attending the Special Session of General Conference from February 23-26, 2019 and asked the district to pray for the delegates and for the entire church. Rev. Rob Rynders, our keynote speaker, shared important and interesting information from a major marketing study of lapsed Christians, active Christians, and people who have not been part of a church who identify as spiritual but not religious. Attendees now know the difference between traditionalists and explorers as well as the continuum that represents most people. 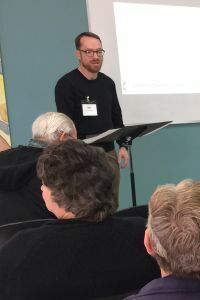 Finding ways to reach out to explorers and nurture their faith is the challenge workshop attendees wrestled with as they heard about the experiences of the Orontes Project (now called Social Thread.) Thank you to Rob for sharing his knowledge and work with us and to Rev. 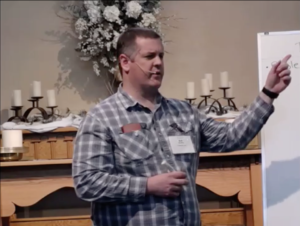 Dave Wasson for sharing his experiences as pastor of Social Thread in the workshop. Thank you to our other presenters, Rev. David McPherson, Rev. Leah Bergstrom, Rev. Joshua Warner, Rev. Tina Marie Rees, and Julie O’Neal. Attendees learned and received resources on discipling, congregational care, mental and behavioral health, conflict transformation, and going green. The main speaker and some of the workshops were shared with our satellite locations in Cottonwood and Yuma. Thank you to our host churches Dove of the Desert UMC, Mountain View UMC, and Trinity UMC in Yuma and to our conference staff, Christina Dillabough and Dina Reid. Following the workshops Rev. Jaime Vazquez shared with those in Yuma about the new Spanish language New Start Church and their day ending with singing by five musicians from San Luis, Mexico. in the District Office. We are eager to hear topics and issues that you would like addressed in the future. Jesus said, “My Father is glorified when you produce much fruit and in this way prove that you are my disciples.” (John 15:8) This continues to be our goal and our prayer.